A Classic Movie Blog: Classic Links, Maternity Leave and Guest Linkers! In just a few weeks I will be welcoming my second daughter into the world. As I already know one child can be time-consuming, I can just imagine how much busier I will be with two. I’d like to take some time to enjoy my daughters and adjust to having a two pack, so I will be taking a sort of leave from the blog for at least the month of May. Though I will not be posting links or responding as frequently to comments and emails, there will still be posts every day. Instead of the links, I will be pre-posting a few little pieces that I wrote on New Years Eve after gorging myself with cheese fondue. They really amused me at the time and I hope that you will like them as well. There will be lots of other little surprises as well, so stick around! As a sort of kick-off for my leave—and so I could get a little extra rest—I decided to have a special event over the next couple of weeks. Instead of compiling the Classic Links myself, I have invited a group of classic movie bloggers to submit links. Rather than three days, there will be four days of links each week. I’ve gathered a diverse group of bloggers and it’ll be loads of fun to see what they come up with. I hope that you will enjoy my guests’ generous contributions. Thanks much for the link, and the very best of wishes on your pending birth! I'll look forward to hearing the little one is safely here. 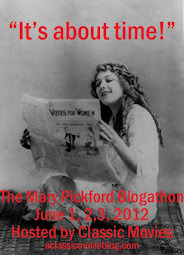 :) Also looking forward to participating in the guest blogger roundup! Oh, a fabulous/aaw kind of news. I am going to miss you, but perfectly understandable. Enjoy your much deserved rest! Aww, KC, congrats, lots of hugs, we'll miss you. Rest a lot, enjoy your daughters. See ya in June. (This sounded like a telegram, LOL). K.C. -- kudos and congrats on your impending rugrat arrival. (You can put off the victory lap until after the delivery, to be sure.) If you need extra help in do the weeding around Classic Movies during your convalescence, I can always find a little time on my hands. Aw shucks--thanks for the kind words everyone. Laura--I'll keep you all updated on baby's arrival! I'm excited to see your guest links. thing--Thanks, I'm already missing it a bit myself, but I know I'll need the extra time. Amanda and Page--Thanks so much! Clara--LOL, a telegram comment, love it. I will miss sharing things with you all as well. Who knows if I'll even be able to stay away a month? Ivan--Yeah, not much for any sort of laps right now. I'm good at shuffling around these days though. Thanks so much for the offer of help. You are always welcome to contribute any time--whenever inspiration strikes! Ah--it's never too late for a kind word. Thanks so much Java!